The thing about Jeb! is that his tragic, whingeing presidential campaign has caused us to partially forget what a horrible human being he actually is. Lately, we have started to regard him much in the same way we would regard a man in a Nickelback t-shirt crying softly behind us in line at Subway—he’s a bummer, in a way that’s kind of entertaining. 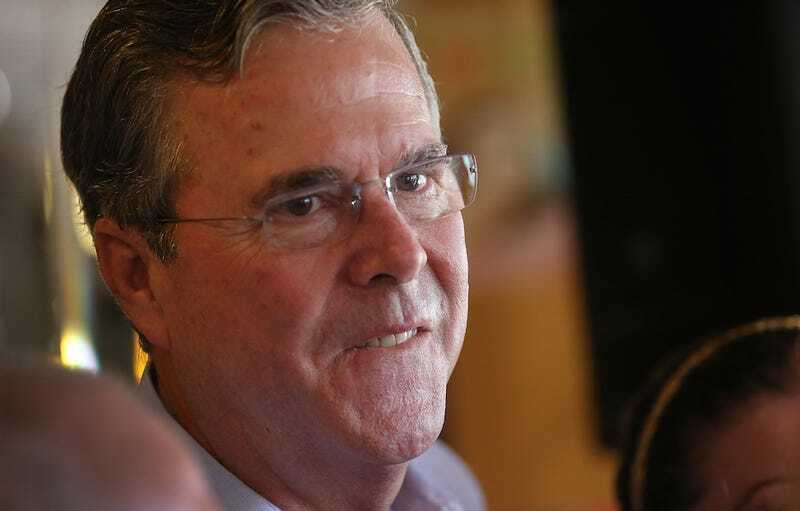 But Jeb Bush is also a veritable Atlas of systemic inequality—whose “Stand Your Ground” law helped to protect Trayvon Martin’s killer, who has been openly dismissive of the Black Lives Matter movement, who supports tax breaks for the wealthy, who turned Florida’s education system into a mismanaged for-profit industry, and who saw nothing wrong with the fact that a black child with a toy gun was shot and killed by Cleveland police. Following a town hall meeting in Lexington, South Carolina, on Wednesday, Bush was asked by reporters to comment on the lack of indictment for the police officers who killed Tamir Rice. Initially, Bush didn’t seem to be aware of the details of the case. “I think that Chicago’s got a lot of work to do to rebuild trust. The level of violence is abhorrent,” he said, after which a reporter corrected him, saying the shooting happened in Cleveland.